The Hubble Space Telescope has captured this brief but beautiful phase late in the life of a star. The curious cloud around this bright star is called IRAS 19475+3119 about 15,000 light-years from Earth is actually the star's atmosphere, being ejected as the star dies. Full Story. Adoomed star has been caught in the act of shedding itsgassy skin in a new photograph from the Hubble Space Telescope. 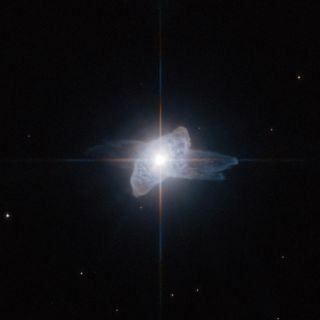 Thenew Hubblephoto of the dying star reveals anodd cloud of gas around the object that is actually the outer layers ofthestar's atmosphere, which are being blown out in jets to create vastlobes inspace. While beautiful, the lobes are rare, short-lived formationsaround thestar and are a telltale sign that death looms near, astronomers said. "Asstars similar to the sun age, theyswell into red giant stars,and when this phase endsthey start to shed theiratmospheres," Hubble telescopescientists said in astatement. Thesun is about 4.6 billion years old, and is expectedto last another 5 billion years before puffing up into a red giant anddying. Thisstar was first spotted in 1983 by the IRASsatellite, which detected the intense infrared emissions coming fromtheobject. But the future is bleak for the star. Asthe star continues to shed its atmosphere, its hottercore will eventually be revealed, Hubble scientists said. When thathappens,the gas surrounding the star will begin glowing brilliantly to create aplanetary nebula. Despitetheir name, planetary nebulashave nothing to do withalien planets. They got their titlebecause of their fuzzyplanet-like appearance when viewedthrough small telescopes. Butthe IRAS 19475+3119 isn't completely dead yet.Currently, it is what astronomers call a protoplanetary nebula. Astronomersused Hubble's Advanced Camera for Surveys totake the dying star's portrait. The once-broken camera was fixed in May2009during NASA's final repair mission to Hubble by astronauts.